Congrats to Adrian (1S2) who made a really perfect lesson report! 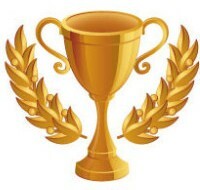 - Blog participation award! That's why you deserve to be the student of the week and to get a bronze cup! Congrats to Imane (TES) who confused "Black hole " for "All Blacks".... So the video was not an advert for Rugby! (which is not a precious stone!) - Funny confusion award!